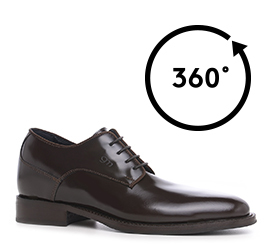 Elevator derby shoe with a classic and elegant design in shiny dark brown calfskin leather and satin details tone on tone. Outsole made of real leather. Extremely refined and ideal for special occasions is able to increase height by 3.1 inches in total comfort and secrecy.